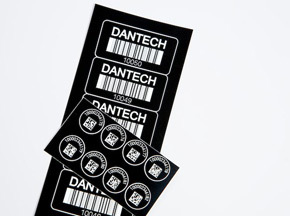 Experts in identification marking and asset labels Dantech offers a wide range of asset labelling options including labels for marking smaller assets and equipment. Companies and organisations often struggle to find quality asset labelling for small items and Dantech have worked with some of the latest technology to produce asset labels for these items that are very robust yet can contain a lot of detailed information. Just because Dantech mini mark asset labels are small doesn't mean their not tough, they can withstand temperatures from –60ºC up to +200ºC - safe in microwave, dishwasher and autoclave. They are also highly resistant to chemicals, abrasion and harsh environments. Minimark asset marking also uses tamper evident and non-transferable material so that if removal is attempted they will fragment. this makes them a strong theft deterrent that also discourages unauthorised asset transfers. Due to their small size these asset labels/tags are suitable for many applications from surgical instruments to musical instruments. For more information or to discuss your asset labelling requirements in more detail call 01354 688 488 or complete our contact form.